George Hamilton started his senior career with Queen of the South before enjoying a long and successful career at Aberdeen. In his five full internationals for Scotland he scored four goals. Hamilton was the first ex-Queens player to travel to the World Cup finals. Born in Irvine in December 1917, George Hamilton started out with local junior side Irvine Meadow before, aged 19, joining top division Queen of the South. The inside forward was comfortable with the ball on either foot and had an obvious love of playing the game. In Hamilton’s single season in Dumfries he scored nine goals in 31 league games. Hamilton’s last two games at Queens have gone down as one of the most dramatic league finishes in the club’s history. At the end of a difficult 1937/38 season with two games to go Queens were second bottom. Morton had long since been condemned to the drop. This left Queens in a seven way dog fight trying to avoid the other relegation spot. Even victory in the last two games of the season wouldn’t guarantee safety; results elsewhere would also have to go Queens’ way. Mission 1 for Queens - beat fellow relegation candidates Kilmarnock at home. As Scottish Cup finalists Killie were clearly not to be under estimated (not that a team second bottom could afford to under estimate anyone). Hamilton gave Queens the lead. His second goal made it 2-0 at half time. However Killie pulled it back to 2-1. Jackie Oakes then took a corner from which Joe Tulip launched a venomous shot at goal. The ball was hand balled over the bar by Killie’s right back. The ref pointed to the corner again. Queens players unsurprisingly protested passionately after which the ref consulted his linesman. The ref now awarded a penalty to Queens. Willie Savage duly despatched it to make it 3-1 for Queens to close the game out with no further goals. This took Queens to fourth bottom. However with all the teams around them having games in hand, Queens were far from out of the woods. Mission 2 for the Queens players - beat Rangers at Ibrox. Despite Queens’ consistent success against Celtic since joining the top league, Rangers had proved another matter. While the win in the previous season’s Scottish Cup was deserved it was also an isolated victory over the Glasgow side. It had also been at Palmerston. Rangers put Queens under early pressure. Bob McPhail shot wide in a one on one with Queens goalie, Mellors. In another attempt McPhail hit the post. Mellors also made a superb one handed save to keep the score blank. In return for Queens, Joe Tulip in front of Rangers’ goal was robbed of the ball as he tried to get his shot in. Having weathered the early storm Queens’ Phil Watson passed the ball out left to Jackie Oakes. Oakes got rid of one defender before cutting inside and then going past another. Now on the edge of the box Oakes fired in a laser guided shot and bang! 1 – 0 for Queens. Soon after the restart Rangers lost possession. Tulip and Jackie Law combined out wide before Tulip made it to the touch line to get his cross in. Law was there to meet the cross and shot instantly and bang! 2 – 0 for Queens. The Queens players were now flying with Hamilton and Law causing Rangers’ defence problems. Hamilton got the better of the Rangers goalie but the ball was cleared off the line. Thomson immediately returned the ball back towards the Rangers box where the keeper was beaten again as the ball this time hit the cross bar. The rebound came to Law again and bang! 3 – 0 for Queens. 28 minutes on the clock and Queens fans must have considered if they were hallucinating. The remainder of the half saw a desperate rearguard action by Rangers with Queens’ forwards in full flow. Oakes came close to adding his second to the score sheet. Tulip also came close. Rangers though served a reminder that they weren’t out of it yet when Mellors was called in to save just before the half time whistle. However no further goals meant it was half time score - Rangers 0, Queens 3. It seemed too good to last. Sure enough it was. With the second half under way McPhail soon evaded a challenge before angling his drive past Mellors. Rangers 1, Queens 3. Tulip again came close to scoring when his free kick from the edge of box was inches too high of the target. A Smith header was inches wide for Rangers before Kinnear’s cross to Turnbull at the near post made it Rangers 2, Queens 3 - 55 minutes on the clock. The tables were now turned. Desperate defence from the Queens players didn’t stop the ball going into the Doonhamer’s net a third time. This time though McPhail’s effort was ruled offside. Queens’ players continued to battle for every ball fully aware their top flight survival depended on it. The forwards troubled the Rangers defence when they could. Despite the continued ebb and flow of the game there were no more goals before full time. Final result; Rangers 2, Queens 3. With statisticians having a field day as the results came in from elsewhere the season-end league table told its story - Queens were safe. Aberdeen, managed by ex Queens’ Dave Halliday purchased George Hamilton for £3000 in April 1938. Halliday would never spend any smarter money than he did on George Hamilton – 102 goals in 203 Aberdeen league games give testament to Hamilton’s goal scoring potency. As with many of his peers, the Second World War hugely interrupted Hamilton’s career. League football in Scotland went into abeyance in 1939 and Hamilton returned to his native Ayrshire. Temporary Regional Leagues were then established. Travel restrictions meant players would guest for local clubs. Thus Hamilton played for Ayr United and then Rangers between 1940 and 1945. Hamilton returned to Aberdeen when global combat ended and enjoyed his most successful period. As decades later Gordon Strachan would be the heartbeat of Alex Ferguson’s Aberdeen side, so it was George Hamilton in the side managed by Dave Halliday. After lifting the transitional 1945-46 League Cup by beating Rangers 3-2 in the final, Hamilton then scored in winning the Scottish Cup Final 2-1 against Hibs the following season. Aberdeen returned to the League Cup final in 1946-47 with Hamilton scoring a hat trick in the 6-2 semi final drubbing against Hearts despite being at supposedly neutral Easter Road. In the same season Hamilton became the first Aberdeen player to score three or more goals against Celtic when on 2nd January he scored four in a stunning 5 - 1 win at Celtic Park. The next Aberdeen player to score a hat trick against Celtic was from Dumfries - Billy Williamson in the 3-2 win at Pittodrie in 1975 in a game in which he played in midfield (Williamson enjoyed further success against Celtic by playing in the 1976 League Cup Final 2-1 victory). Despite Hamilton’s form, when Hearts offered £8000 plus the younger Archie Kelly for his services in December 1947, the Reds considered it good value for a 30 year old and accepted. Hamilton’s first Hearts goal was in the 1-1 draw away to Partick Thistle on 31st Jan 1948. This was the start of a 10 game unbeaten league run lasting to the season’s end. The last game of the league season was Hamilton’s last for the Jambos, the 2-1 win at Ibrox - Hamilton scored a 75th minute winner. Rangers finished the season two points behind champions Hibs. After only half a season and 15 competitive games for Hearts (scoring six goals in 13 league appearances and one goal in the Scottish Cup) plus two friendlies, an unsettled Hamilton returned to Halliday’s Aberdeen for £12,000. In March 1950 George Hamilton played for Aberdeen in a landmark Scottish Cup quarter final game – a landmark game for Queen of the South. With Hamilton pulling the strings the Dons were three goals up within 15 minutes. However Queens pulled the three goals back to force a replay in Aberdeen – a game Queens won 2-1 to go to the Scottish Cup semi finals for the first time. Hamilton’s fine form helped Aberdeen to two further (losing) Scottish Cup Final appearances, in 1953 and 1954. The years then started to take effect as he largely looked on from the sidelines as a young Dons side won the 1954-55 League title with the long serving Halliday still at the helm. Hamilton was then transferred to namesake Hamilton Academical in 1955. 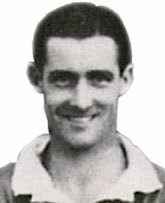 Hamilton’s consistent good form in 1945-46 earned selection for two games against England that have not been awarded cap status. Both in April ’46, the first was one of the ’Victory Internationals’ arranged following the end of World War 2. Scotland won 1-0 thanks to a Jimmy Delaney goal before an astonishing Hampden crowd of 139,468. The second was the benefit game after the Burnden Park disaster in Bolton. Willie Thornton and Don Welsh both scored a double in the 2-2 draw at Maine Road. This was watched by another big crowd - 70,000. Hamilton’s Scotland national team official debut was in the 0-0 draw against Northern Ireland on 27 Nov 1946. He earned an international recall in 1951 when he scored a hat-trick in trouncing Belgium 5-0 away. This is one of only two Scottish national team hat tricks so far by an Aberdeen player (the other was by Alec Cheyne). A week later it was a different story as the then powerful Austrian side handed out a trouncing of their own – a 4-0 away defeat for the Scots. In 1954 when aged 36, he was recalled again ahead of the World Cup finals in Switzerland. He played in two build up games against Norway scoring the only goal of the game played in Scotland. The return game in Scandinavia was 1-1. Hamilton was then selected in the 22-man squad for the finals. To quote the SFA website on the Scotland expedition to the 1954 World Cup finals:-“The preparation was atrocious, Scotland only travelled with 13 players”. Utterly bizarre as this seems now it is hardly surprising of the SFA at the time. For the previous World Cup, FIFA announced the top two teams in the UK International Championship would be offered places at the finals. Then SFA Secretary George Graham announced that Scotland would only attend the finals if they won their qualification campaign. When Scotland finished runners up, incomprehensibly, Graham stuck to his guns. In 1954 things weren’t helped by Rangers’ refusal to release players for the finals. The Ibrox policy makers of the day deemed it more important to take their players on a North American tour - similarly Hearts toured to South Africa. Hamilton was one of the nine players to stay at home on reserve with the likes of Queens´ Jimmy Binning and Portsmouth’s Jackie Henderson. However Hibs’ ‘famous five’ inside right Bobby Johnstone withdrew through injury, with Hamilton called in to replace him in the 13 to travel. Bobby Evans also had fitness concerns yet wasn’t replaced in the travelling 13. The blunders of the SFA executive committee were not confined to squad arrangements. Players weren’t provided with training equipment meaning players had to provide their own. Training sessions took place in public parks. Other squads had lightweight gear appropriate for the heat of Central European Summer. The Scots team played in the heavy gear more appropriate to a January night at Palmerston. The first game was against Austria and despite a creditable show the Scots lost 1-0. Hours before the next game, against reigning champions Uruguay, Scotland manager Andy Beattie finally decided he had seen enough of the incompetence of the SFA. Beattie resigned. In the melting heat of the sun and with Uruguay all time great Juan Schiaffino providing the ammunition for his team mates, the Scots were made to suffer. Like Bobby Evans, George Hamilton did not play in either of Scotland’s two games. Austria went on as far as the semis. Schiaffino and Uruguay knocked out Ivor Broadis’ England in the quarters. The Hungarians needed extra time to see Uruguay off in the semis. George Hamilton was the first player to travel to a World Cup Finals with Queen of the South on his CV as an ex club. Sammy Malcolmson repeated the feat in Spain in 1982 after he emigrated to New Zealand. The third player to do so was Bernie Slaven at Italia 90 after he defected to play for Eire. Of the three only Malcolmson has played at the World Cup finals. Ironically his one game was the 5-2 defeat by his native Scotland. George Hamilton also gained three caps for the Scottish League scoring two goals. George Hamilton retired a matter of months after joining Accies, just after his 38th birthday having scored twice in 11 league games for the club. After hanging up his boots George Hamilton joined the Aberdeen coaching staff.